Once again, this is a thought-provoking novel by Per Petterson, who came to world attention with Out Stealing Horses, but this novel has more in common with his debut novel It’s Fine By Me (1992, but not translated till 2011). (See my review). Once again there is the loss of siblings and an abusive father, and the focus is on a teenage protagonist’s choices in dealing with tragedy. I Refuse is constructed in a patchwork of voices, recalling both the recent past in adulthood and also events from childhood and adolescence in the 1960s and 70s. The novel begins in 2006 when middle-aged Jim, driving in the dark, almost hits a man. He thinks for a moment that it’s his father, but he has never seen his father. He’s been drinking, and he may or may not have remembered to take his pills. With deft touches of detail – a makeshift bait rig, a frayed coat – Petterson establishes this character as a troubled man, short of money, and subject to panic attacks. What sparks the panic attack is an encounter with his old childhood friend Tommy. Jim is taken aback by the change in their relative circumstances, because Tommy is rich now, driving a Mercedes and wearing an expensive coat and leather gloves. He smiled. ‘We each went our separate ways that time, didn’t we?’ He said it neither this way nor that way. ‘That’s true,’ I said. He smiled, he was happy to see me, or so it seemed. ‘And here you are, on this bridge, fishing, with your cap on, and here I come, in this car. It didn’t come cheap, I can tell you that much. But I can afford it. Hell, I could have bought two, or more, if I wanted. Isn’t it strange,’ he said with a smile. Indeed it was strange. The circumstances of their boyhood would have predicted a different future for both of them. Fate might have decreed that Tommy would end up a loser or a no-hoper. Because the next chapters take us to Tommy’s narrative in 2006 when the police ask him to come and collect his drunken father who he hasn’t seen for decades, and to 1962, where we learn about his fragmented memories of his mother Tya who abandoned her young family to the brutality of her husband. At this time Tommy and Jim are close boyhood friends, who thought that it was a creative idea to have two [parents] until they realised that it was what most people had, on a permanent basis. In one confronting sequence after another, the reader learns just how brutal Berggren is, and how Tommy aged thirteen finally fights back. With a sense of destiny he sends the small twins over to the Liens’ house for safety, while his sister Siri aged twelve cowers upstairs. Tommy then confronts his father who lashes out in fury. With a broken rib and a gashed eye, Tommy takes to his father with a rounders bat, knocking him out and breaking his ankle. I stood up, put the bat down on the floor beside his smashed leg for everyone to see. And then I called Siri. She came down the stairs. She was crying and smiling and was in the same state that I was in behind my one eye. She hooked her arm under mine, around my back, and I said nothing about the pain her arm inflicted as she tried to lift me the way we had seen in films when they helped the wounded soldiers from the trenches, and the war was won, but the battle lost, and she was too light, of course, and I was too heavy, yet we walked through the hall in that fashion, through the door and into the light, and the sun slapped me gently on my face and was still shining from the same blinding white sky as it had early this morning and had stopped in its course on this very special day when something was going to happen that everyone had been waiting for, and now it had. The father disappears and the children assume that he is dead. Despite their best efforts to manage the house, the family is split up. The twins are kept together with a family in Lien, but Siri is sent to live with ‘model Christians’ in the town of Mørk; they discourage contact and won’t even let Tommy attend her confirmation. Just one person in the community offers support: Tommy goes to live with his friend and mentor Jonsen, a man whose secrets are revealed much later in the story in his own narrative. Jonsen is the father substitute who – because he has never had children himself – treats Tommy like an adult, like an equal. He provides a home, and eventually gives Tommy a job at the saw mill. From an inauspicious start in life, Tommy – just as he refused to submit to his father – Tommy refuses to let his circumstances define him even as his family fragments. But the outward signs of his success can’t restore what he has lost or undo the damage caused. For Jim, things are very different. He descends into mental illness, and becomes a drifter. In his fifties, he wonders briefly if he misses the father he has never known. As in his other novels, Petterson captures ‘taboo’ interior thoughts: Jim is almost jealous of Tommy because a violent father might be better than no father at all. In boyhood Tommy plots ways to kill his father and in adulthood refuses to contemplate making peace with him. Fru Berggren (Tommy’s mother) lets her soul sink into the dark well of perdition with no more than a hurried, already vacant glance over her shoulder. One of the saddest moments in the book is when Siri decides that it’s more important to her to get to a handball game than to hang around with her lonely brother. Her absence from Tommy’s life is chosen. Some long absences result in chance meetings. Jim and Tommy meet again in middle age; Tommy is brought to rescue his long absent father. Siri, in Singapore, finds traces of her long lost mother, and refuses to acknowledge it. Refusals are both destructive and constructive, but in the trenches of family violence, a victory can be phyrric. As you can see from the excerpts I’ve quoted, the translation is flawless. In spare prose of intense clarity, Petterson conveys both the beauty and the ugliness of the external environment. Long sentences – held together with the simple conjunctions ‘and’ and ‘but’ – construct the claustrophobic thoughts of his characters, while the dialogue is often flat, stilted, and fractured in order to represent the way relationships of all kinds are compromised by long-term emotional damage and the survival strategies his characters have used to cope. 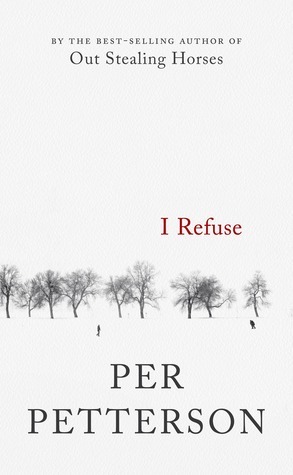 Update: If you haven’t read Per Petterson’s earlier novels, check out Gert Loveday’s reviews here and also this one of I Refuse. PS In the wake of the 2015 launch of Change the story: A shared framework for the primary prevention of violence against women and their children in Australia, bloggers like me received a press release asking us to include the following tagline to any relevant coverage of sexual assault, domestic and family violence. With the release of the report of Victoria’s Royal Commission into Family Violence, it is especially timely today. I read this when it first came out in late 2014 (in Canada we sometimes get both the UK and the US releases). Petterson is one of my favourite writers and I believe this is his best book yet. Of course it spoke deeply to me because the main characters are men my age and I was, at the time, recovering from a serious mental health breakdown. I’m so happy to see this on the BTBA list. Hello again RG, I was pleased too. I find Petterson illuminating. It’s not just that he’s writing about a place and a culture that I know so little of, it’s that he enriches my understanding of how people might think and feel. Your response to this book (thank you for sharing it) shows me that Petterson has created an authentic story. I am a fan of Per Petterson’s novels, even though they are always on the sad side. I love character driven books and Petterson portrays his characters and life so well. His novels are ones you always want to reread because of the impact they have on you. Excellent insightful review Lisa and timely indeed! I love character driven stories too. I just loved this book and like you thought the translation was impeccable. Per Petterson is one of the writers I like best. We reviewed I Refuse last year. I loved I Curse the River of Time too which we also reviewed. Can I have the URLs of your reviews please? Here is our review of I Curse the River of Time and in the Wake. I will send I Refuse in separate comment.